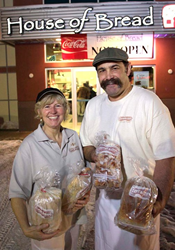 House of Bread Franchisees, John and Ginna Baldiviez as well as their sons Carson and Sterling, have won the small business of the year for the great state of Alaska. They will be traveling all the way to Washington D.C. to be honored by the Small Business Administration this May. The Baldiviez’s commitment to product quality, customer service and being generous with the community are validated by the customers shopping decisions and for the US government to recognize one of our franchisees- is a very proud moment for us. The criteria used in selecting the winners are the staying power of the business, the growth in the number of employees and sales as well, as profit and loss statements. It isn’t all about the money; they also consider innovativeness of product and service, and contributions to the community. Sheila McCann after six years as a trial lawyer opened the first House of Bread in San Luis Obispo, Calif., in 1996. Soon afterwards, she began a national franchise program that expanded into 7 states by 2014. All House of Bread recipes rely on fresh, high-quality all natural ingredients and are produced in an open production site. For more information, go to http://www.houseofbread.com.